StanCon 2018, 29–31 August, introduces cutting-edge methods and applications for statistical modelling—ranging from galaxy clusters to social media, brain research, and anthropology. In Finland, AI research is particularly strong in the field of medicine. ‘Statistical modeling can be used, for example, to improve the safety of drug testing in children. The time it takes for a child’s body to metabolise a drug depends not only on the weight of the child, but also on the ability of the liver to process the drug. The dosage size of the drug should, then, be reduced more than the weight alone would suggest. Modelling methods can be used to evaluate the effects of drugs on an individual level,’ says Aki Vehtari Professor at Aalto University and FCAI, and member of Stan development team. One of the keynote speakers at the conference, Maggie Lieu, a researcher at the European Space Agency, uses statistical modeling to determine the mass of galaxy clusters. VTT will bring their strong industry networks and their know-how in applied technology to the FCAI community. Their help will enforce FCAI’s ability to put the top research in both founding universities into far-ranging and efficient use in companies, public organisations and society at large. FCAI promotes high-quality research and education on artificial intelligence in Finland and the applicability of AI to benefit companies and society. VTT will expand FCAI’s ability to speed up the necessary renewal and competitiveness of Finnish industry through AI-based innovations. FCAI strives to make the new generation of AI methods a reality: create AIs that are understandable, trustworthy, and data-efficient. FCAI's goal is to expand into a national network of universities, companies and research institutions who will lay the groundwork for Finland to become a global leader in AI research and AI applications. Growth in any strand of industry depends on the ability to make use of cutting-edge technology. Artificial intelligence is the key leverage here. ‘Our vision is to bring our high-class research in several strands of artificial intelligence to benefit people's every-day lives, companies and public bodies. FCAI’s impact is a potent mixture of research, a network of startups, doctoral education and competence building in AI, new innovative products and services, and smart experiments in public administration,’ says Head of FCAI, Academy Professor Samuel Kaski. ‘The single most significant growth factor now is applying artificial intelligence and ICT in general. For citizens, new innovations and solutions will bring a change in work content, professional skills, and the services society provides. AI will be able to make, for instance, medical care more efficient and personalised,’ says Tua Huomo, Executive Vice President at VTT. FCAI is building a national hub of universities, research institutes, industry and the private sector and public organisations with strong international networks. The FCAI community is constantly expanding with new memberships and projects. Determining the composition of bacterial communities at strain level resolution is critical for many applications in infectious disease epidemiology and in bacterial ecology. Using the latest advances in computational inference and sequence analysis, an international team involving close collaboration with leading institutions on bacterial genomics, including the Wellcome Sanger Institute and University of Oxford, led by professors Jukka Corander and Antti Honkela (both in FCAI) has developed a new metagenomics tool called mSWEEP, which goes significantly beyond the state of the art in this field. The effectiveness of mSWEEP is demonstrated with infection data from major human pathogens and it is expected to pave the way for entirely new approaches to addressing important biological and clinical questions about inter-strain competition, dissemination of resistance and virulence. The research article: High-resolution sweep metagenomics using ultrafast read mapping and inference. Professor Jukka Corander (FCAI, University of Helsinki, University of Oslo) interviewed with the Academy of Finland about his work on new kinds of artificial intelligence methods for drug and vaccine development and for analysing bacterial populations. In FCAI, Professor Corander is the Responsible Coordinator of the Simulator-Based Inference research group. The City of Espoo has become a member of the Finnish Center for Artificial Intelligence FCAI. FCAI is a research centre launched by Aalto University and University of Helsinki, which gathers together the best artificial intelligence researchers in Finland. FCAI's objective is to make the most advanced methods of artificial intelligence available to enterprises, organisations and society. The City of Espoo sees that developing artificial intelligence together will be beneficial for the whole innovation community from enterprises to R&D organisations and the inhabitants in Espoo. “For a researcher, the data in the databases of the city of Espoo and the shared databases of the Helsinki metropolitan area is very interesting. Especially the innovative start-up companies in the area and Espoo's desire to be profiled as a pioneer in the use of intelligent technologies set a good basis for cooperation with researchers developing artificial intelligence. We have all the prerequisites to expand our cooperation to other research centres and other cities as well,” says the Head of FCAI, Academy Professor Samuel Kaski. “On the one hand, researchers need data for the development of artificial intelligence methods and technology, and public organisations have this data. On the other hand, we as a city get to use the methods, technologies and the latest knowledge of artificial intelligence research in the development of our services,” says Tomas Lehtinen, data analyst consultant for the City of Espoo. There are several real-world situations where obtaining clean training data is difficult. For instance, low-light photography – astronomical imaging, for example – physically-based image synhesis and magnetic resonance imaging are such cases. Aalto University and FCAI professor Jaakko Lehtinen with his team from NVIDIA and MIT postdoctoral researcher Miika Aittala show in their paper accepted to the International Conference on Machine Learning ICML 2018 that it is possible to recover signals under complex corruptions without observing clean signals, at performance levels equal or close to using clean target data. They have applied basic statistical reasoning to signal reconstruction by machine learning — learning to map corrupted observations to clean signals — with a simple and powerful conclusion: under certain common circumstances, it is possible to learn to restore signals without ever observing clean ones, at performance close or equal to training using clean exemplars. The team applies their methods to photographic noise removal, denoising of synthetic Monte Carlo images, and reconstruction of MRI scans from under-sampled inputs. All cases are based on only observing corrupted data. Recent work by FCAI researchers Tuukka Ruotsalo, Tung Vuong, Khalil Klouche, Salvatore Andolina and Giulio Jacucci investigate the role of interactive machine learning in exploring data. Their particular emphasis is on efficient user input and transparency of recommendation – the ‘how’ and ‘why’ of search queries, respectively. In one case, users explore points of interests using available social content and review data from Yelp Phoenix, Arizon (11,000 PoI; 225,000 reviews; 42,000 users): personal preferences, tags combined with personal preferences, and tags and social ratings combined with personal preferences. The transparency (provenance) of recommendation was decisive as the combination of social rating information and personal preference information improves search effectiveness and reduce the need to consult external information. In other research in exploring the entire data set of scientific publications over 50 million papers, the FCAI team have been able to show – using similar graph-based machine learning – how to support efficient user input in exploration by allowing users to easily interact with entities such as people, keywords and documents. The research is a prime example of interactive AI and has important implications for developing system that aid exploration of products, documents, points of interest or people. The examples showcase how online machine learning can make use of user input for interactive AI. Aalto University and FCAI professor Harri Lähdesmäki has with his colleagues introduced a new paradigm of non-parametric ordinary differential equations modeling that can learn the underlying dynamics of arbitrary continuous-time systems without prior knowledge. For many complex systems it is practically impossible to determine equations or interactions that would govern the underlying dynamics. In these settings, a parametric ODE model cannot be formulated. Lähdesmäki and his team have now overcome this issue. They propose to learn non-linear, unknown differential functions from state observations using Gaussian process vector fields within the exact ODE formalism. They demonstrate the model’s capabilities to infer dynamics from sparse data and to simulate the system forward into future. The paper has been accepted to the International Conference on Machine Learning ICML 2018. Making efficient use of sensitive big data and keep it safe and private? A new method developed by FCAI researchers of University of Helsinki and Aalto University together with Waseda University of Tokyo can use, for example, data distributed on cell phones while guaranteeing data subject privacy. Modern AI is based on learning from data, and in many applications using data of health and behaviour the data are private and need protection. Machine learning needs security and privacy: both the data used for learning and the resulting model can leak sensitive information. Based on the concept of differential privacy, the method guarantees that the published model or result can reveal only limited information on each data subject while avoiding the risks inherent in centralised data. In the new method, using distributed data avoids the risks of centralized data processing, and the model is learned under strict privacy protection. Privacy-aware machine learning is one key in tackling data scarcity and dependability, both identified by FCAI as major bottlenecks for wider adoption of AI. Strong privacy protection encourages people to trust their data with machine learners without having to worry about negative consequences as a result of their participation. The method was published and presented in December in the annual premiere machine learning conference NIPS: https://papers.nips.cc/paper/6915-differentially-private-bayesian-learning-on-distributed-data. FCAI researchers involved in the work: Mikko Heikkilä, Eemil Lagerspetz, Sasu Tarkoma, Samuel Kaski, and Antti Honkela. A new AI method adapts touchscreen interfaces to make more out of the capabilities of aging users and users with disabilities. Researchers at Aalto University and FCAI, Finland, and Kochi University of Technology, Japan, developed a new algorithmic approach to user interface optimization that takes individual differences into account. ”The majority of available user interfaces are targeted at average users. This “one size fits all” thinking does not consider individual differences in abilities – the ageing and disabled users have a lot of problems with daily technology use, and often these are very specific to their abilities and the circumstances,” says postdoctoral researcher Jussi Jokinen at Aalto University. ”There are ways to automatically optimize the user interface, but this is efficient only if we have a realistic model of the user. Previously, designers did not have detailed models that are based on psychological research and can be used to predict, how different individuals perform in interactive tasks." 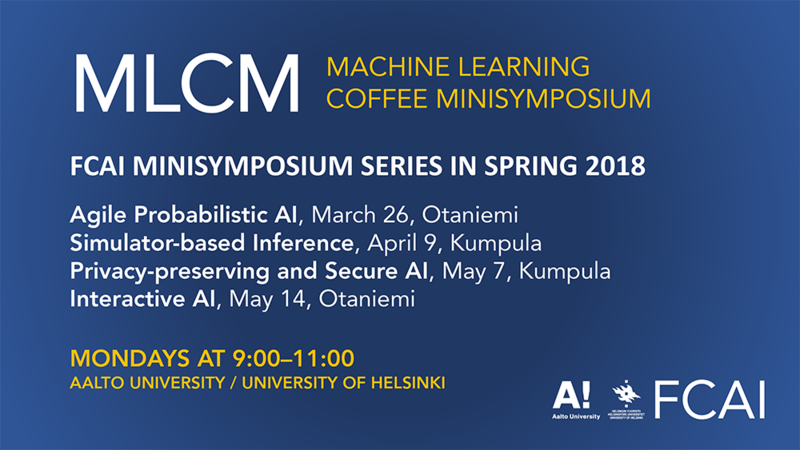 FCAI launches a series of minisymposia on leading trends in Finnish AI research. The future minisymposia will include sessions on simulator-based inference, privacy-preserving and secure AI as well as on interactive AI. See here for the full programme for the spring 2018.